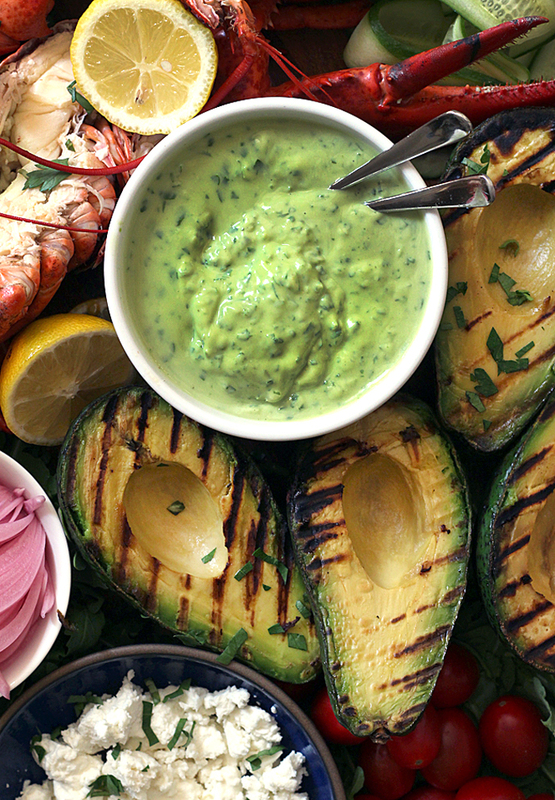 Recipe for Grilled Avocado, Lobster, and Corn on the “Cobb” Salad Board with Avocado Green Goddess Dressing first. Shopping resources, additional recipe suggestions and tips, and personal notes follow. 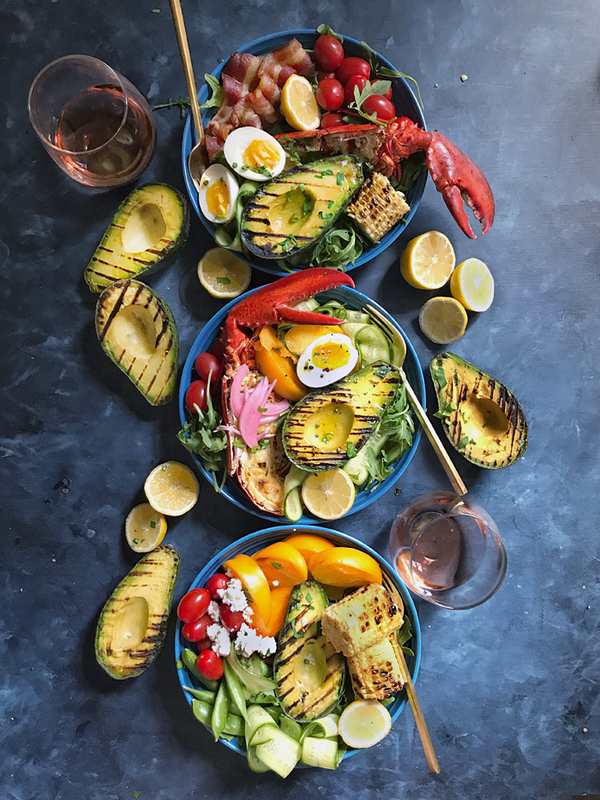 My Grilled Avocado, Lobster, and Corn on the “Cobb” Salad Board with Avocado Green Goddess Dressing recipe draws inspiration from the original Cobb Salad created at the Brown Derby restaurant in Hollywood, making it the perfect California recipe to showcase a perfect California ingredient. I created this recipe in partnership with the California Avocado Commission to celebrate summer as both peak avocado, and peak entertaining, season! Grill Avocados, Corn, and Lobster: Heat grill to medium-high. Slice each avocado in half lengthwise and remove pit. Rub the cut sides of the avocados, including the “divot” from the pit, with grapeseed or other neutral, high-smokepoint oil. Rub shucked ears of corn with oil. Place avocados cut side down, and corn, on hot grill. Cook the avocados and the corn for 8-10 minutes, until dark grill marks appear on the avocado. Do not move the avocados around on the grill. Rotate the corn every few minutes so they grill on all side. 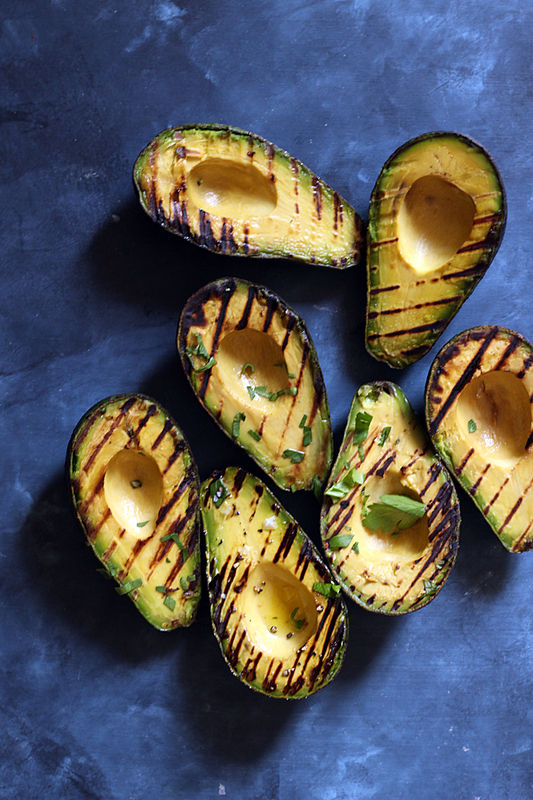 Remove avocados and corn from grill onto a plate and set aside to cool. Cut each cooked lobster in half lengthwise, all the way through the shells. Rub the cut sides with grapeseed or other neutral, high-smokepoint oil. Place lobster halves cut side down on grill. Allow the lobsters to develop color, 8-10 minutes. Do not move the lobsters around except to peek underneath for grill marks. Remove from grill onto a plate and set aside to cool while assembling the remaining ingredients for the salad. Grilled avocado, bacon, corn, and whole, peeled cooked eggs can be cooked a day ahead and kept in the refrigerator overnight. Simply take them out of the fridge an hour or so before to take the chill off. 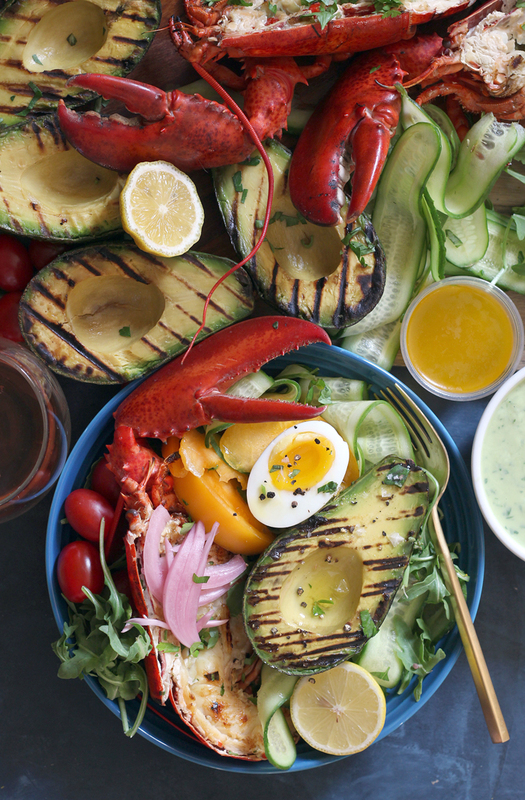 Assemble the Salad: Place the grilled avocado, corn, and lobsters on a very large serving platter or board. 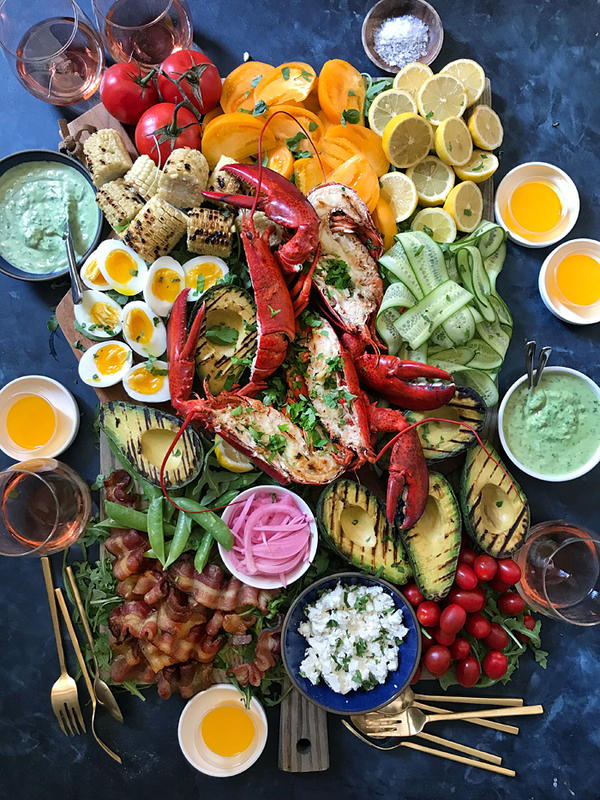 Arrange the cooked bacon, cooked eggs, tomatoes, lemons, cucumbers, snap peas, pickled red onions, cheese, and any other optional salad ingredients you might be using artfully around the avocados and lobsters on the board. Dress the greens very lightly dressed with the Avocado Goddess Dressing, then tuck handfuls of the dressed greens into spaces between the other ingredients on the board. Hit everything with black pepper and chopped fresh herbs including parsley. Serve with Avocado Goddess dressing in small bowls alongside, awesome crusty grilled bread with soft salty butter, and bottles of rosé. Everyone gets to dive in and make a plate for themselves. The fastest and easiest method for making this Avocado Green Goddess Dressing is with a food processor. However, if you don’t have a food processor, don’t fret. As long as you have a good knife, you can mince, chop, mash, and stir everything by hand. However if you don’t have hands, I got nothin’ for ya. Make the Dressing in a Food Processor: Chop garlic and anchovies on medium/low speed in a food processor. Add herbs, and some of the lemon juice to “help” the ingredients process. Add the avocado, yogurt, lemon juice, vinegar, and salt, and process until smooth — processing avocado gives the dressing a fluffy, mousse-like consistency. Taste, and add additional salt to taste (only if needed). With the food processor running, add water one tablespoon at a time to thin out the mixture to a pourable dressing-like consistency (as opposed to a thicker, dip-like consistency). Make the Dressing by Hand: Very finely mince garlic cloves and anchovy fillets, using the side of the knife to press and scrape the garlic and anchovies into the cutting board to create a coarse paste. Place minced garlic and anchovies in a bowl. Finely chop Italian parsley, basil, scallions and/or chives and dill, then add to bowl. Using a fork, mash the avocado into the minced ingredients in the bowl using a fork. Vigorously stir in yogurt, lemon juice, and vinegar. Stir in salt, then taste. Add more salt to taste. Stir in water as needed to thin the consistency of the dressing. Dressing will keep, tightly sealed, in the refrigerator for five days. Avocados are from California. Obviously! Corn is from the farmers’ market. You can cook the ears of corn by steaming/boiling, or even grilling them in their husks, which keeps the corn kernels juicier, but then you don’t get the charred look and flavor on the kernels. Live Maine lobsters from Santa Monica Seafood, $18/pound. I have a whole story about cooking live lobsters. It is for another day. 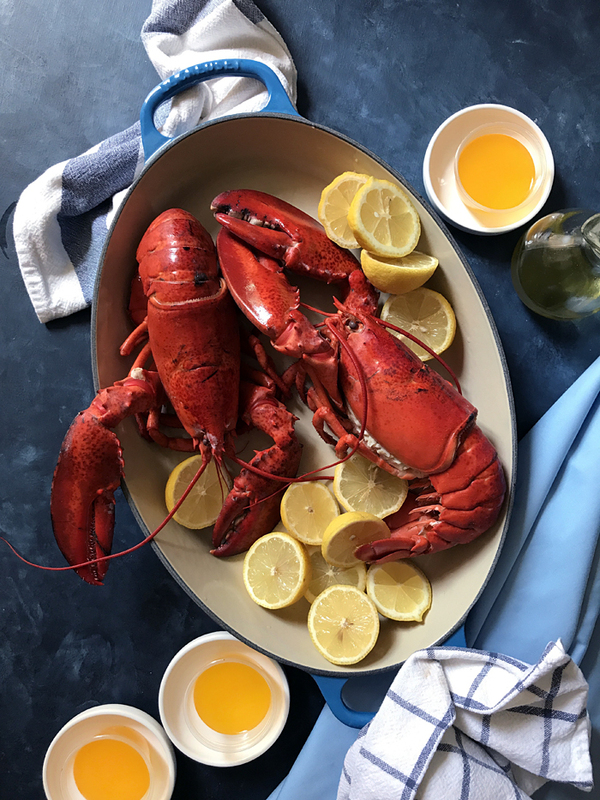 On lobster serving sizes: I generally allot half a lobster per person, which is a LOT of lobster per person given the other hearty ingredients in the salad, but it makes it easy for serving — how would you split a lobster four ways? who gets the coveted claws?! Most people will not eat all of the lobster, because of all the other delicious little things on the board. However, leftover cooked lobster meat will keep for about three days in the refrigerator, or frozen for a few weeks, and is a great protein addition to your lunch and dinner grain bowls. Let’s not even get started on Lobster Nachos. Bacon from the somewhat over-priced butcher at Whole Foods Market at 3rd and Fairfax. If you want to make your bacon look wavy like we did here, use this recipe for roasting bacon in the oven on a wire rack. Type of Greens: According to sources, the original Cobb Salad was served with watercress. But this is almost nothing like the original Cobb Salad, so use whatever the hell greens you like, if any at all. The greens in these photos are wild arugula, which are tender in texture, spicy in flavor. The original Cobb Salad has blue cheese, which I LOVE, but I used feta here because some people are weirded out by the very strong smell of blue cheese. Not that feta is any milder, as it still has tang, but not as much funk as blue. If the Avocado Green Goddess is too thick/creamy as a dressing for you or your guests’ taste, serve it separately as a dip, and dress the salad with a basic white wine, red wine, or Champagne vinaigrette, or even a lemony-slash-roasted-garlic vinaigrette would be ok, too. Speaking of wine, my favorites to drink with this salad are rosé, chenin blanc, and light bright sparkling white wines. This rosé and this rosé, like avocados and this salad, are both made in California and are two of my favs.